Akershus Fortress is situated within the centre of Oslo. It is an area which lends itself marvellously to recreational activities. Visitors to the fortress area may enter through several gates: the main gate in Kirkegata, through the “Sortie” gate at the end of Akersgata, by the Munk Tower next to the cruise terminal, from the “Outer Tenaille”; the gate under the Resistance museum, through the gate in Skippergata or through the entrance in Kongens gate. Once inside the inner fortress area, you may enjoy the exhibitions at the Resistance Museum, Akershus Castle and the Castle Church. The Armed Forces Museum is situated on the outer fortress area, as well as the grand Fortress Square on which you can behold the National Monument to the liberation after the Second World War. The Gate by the Munk Tower: closed. Throughout 700 years, Akershus Castle has played a central role in Norwegian history. As a Royal residence, centre of administration and as a military fortification, the fortress and the castle have been the stage of both mundane and dramatic events, inhabited and visited by several significant historical persons. As of today the castle continues to thrive at the centre of historical events, being the Norwegian Government�s principal location for official functions and state occasions. A visit to Akershus Castle is a journey through Norway�s history from the 12th Century until the present. You may admire the beautiful historically restored halls or marvel at the gloomy dungeons and dark hallways. Our guide will awaken the historical presence of Håkon V Queen Margrethe, Christian IV, ghosts and murderers, the Norwegian poet Henrik Wergeland and other exciting persons. 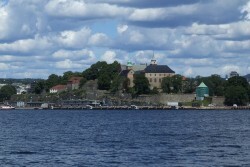 Akershus Castle is under the custody of the Norwegian Armed Forces through Akershus Commandery. The Commandery of Akershus Fortress wishes to develop the castle as a destination for visitors to Oslo and welcomes you to the castle and the fortress. At Akershus Fortress we offer guided tours of the fortress� outdoor area, of the old prison area and of the casemate; an underground vaulted room for canons. Schools, military and private groups, concerns and societies are all welcome to book guided tours. Daily, during the summer season, we offer guided tours for tourists and visitors at the outdoors area, the former prison and the fortification. These tours are free of charge. Click here to send an e-mail to the liaison service. During these months you may only enter the castle by joining guided tours on Thursdays at 12pm (Norwegian), 13pm (English) and 14pm (Norwegian). The tour is approximately 50 min. Please note that the castle or parts of it may be closed occasionally due to official functions. Groups of 10 persons or more NOK 45 per pers. * Handicap access: the castle is an old building with several staircases and narrow hallways and is as such ill adapted to visitors using wheelchairs. Persons in wheelchairs are advised to contact the castle in advance to their visit in order to arrange assistance and adjustments. Entrance is free for visitors in wheelchairs and their aide. * Photographing is permitted inside the castle, but the use of flash and tripods are prohibited. * Strollers, large bags, backpacks etc. must be stored with the castle staff on entering. * Public restrooms are located under the King�s Bastion, on the other side of the road from the Resistance Museum. * You may not bring food or drinks inside the castle. * Please note that many of the castle�s exhibited items are very old and fragile. Please help us preserving these items by refraining from touching them and sitting in the old chairs exhibited. Groups are welcome to book guided tours throughout the year, also after regular opening hours. This tour takes you through the entire castle and offers a brief but broad overview of its 700 year long history. The tour offers bits and pieces from a selection of events and topics from different historical periods. This tour concentrates on the remnants of the medieval castle, which makes up the core of the castle today. The visitors will enter through the medieval castle�s original entrance “the Dark Passage”, and continue indoors in the Hall of Margrethe and the Hall of Olav V. You will learn about medieval castle architecture, medieval life at the castle and famous medieval persons connected to the castle�s history. Please note that this tour does not include the entire castle. Akershus Castle displays an impressive collection of furniture, tapestries, paintings and chandeliers dating from the 15th and 16th Century. On this tour you will become acquainted with a selection of items, their history and use, and you will learn about how the castle was equipped when functioning as a Royal Residence for the Danish-Norwegian King Christian IV. The tour visits the halls on the 1st floor, today used for official representation, and the Castle Church. What ever did Mister Peder meet in “the Dark Passage” one night in 1550? Who is lamenting in the Hall of Romerike during dark nights in August? On this tour through the castle, only illuminated by candles in the dark of eve, our guide will tell tales of the many ghosts, witches and other uncanny beings associated with the castle. Click here to book a guided tour for your group. School classes at every level are welcome to book guided tours at the castle during weekdays between 9am-16pm. The Introduction to Akershus Castle (see above) and the Medieval Castle (see above). Fee: NOK 300, - per class/group. Click here to book a tour for your school class. The Castle Church is today the Norwegian Military�s principal church. The garrison priest has the responsibility of planning and coordinating services and church events. Spring Services commence on Annunciation Day (mid-March) and is concluded at the end of June. Fall Services commence in August, and continues until the first Advent Sunday. During these periods there are morning services each Sunday at 11am, and during other Church Festive Days. The services are announced in the weekday papers and are open to all. On Christmas Eve, 1st Day of Christmas, New Years Eve and the 17th of May, service will be held at the Castle Church, open to all. Persons connected to the Norwegian Armed Forces are able to use the Castle Church for weddings. The wedding season lasts from the beginning of May until the end of June, and from the beginning of August until the end of November. In April, September, October and November wedding ceremonies can be held on Fridays at 13pm and 14pm, in May, June and August on Friday and Saturday at 16.15pm and 17.15pm. Persons connected to the Armed Forces are able to use the Castle Church for christenings. Christenings are conducted during Morning Service on Sundays. Church Parades are held in December, and prior to Christmas there are services for units in the Oslo area. Church parades, services and devotions may be held during the visit of fleets or international units. Questions concerning services, christenings, weddings or other, please contact the garrison priest, phone: +47 23 09 88 16 or the priest�s assistant, phone: +47 23 09 88 17.